C Major released two Tchaikovsky bonbons straight from Vienna – The Nutcracker and Swan Lake. As the main classical ballet company in Austria, the Vienna State Ballet (Wiener Staatsballett) isn’t particularly over-represented on home video, so these recent performances filmed live in high-definition at the Vienna State Opera are definitely welcome. The driving force behind these releases is without doubt former Paris Opera Ballet étoile Manuel Legris, who is leading the Viennese company since 2010 and has by all accounts established himself as a blessed gift for the thus far slumbering Austrian troupe. 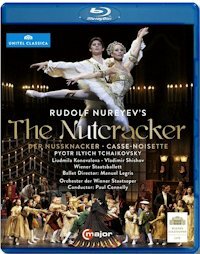 Categories: Blu-ray and DVD reviews | Tags: Alexander Ingram, ballet, classical ballet, dance, Liudmilla Konovalova, Manuel Legris, Marc Haegeman, Olga Esina, Paul Connelly, Piotr Ilyitch Tchaikovsky, Rudolf Nureyev, Russian ballet, Swan Lake, The Nutcracker, Unitel C-major, Vienna State Ballet, Vladimir Shishov, Wiener Staatsballett | Permalink.